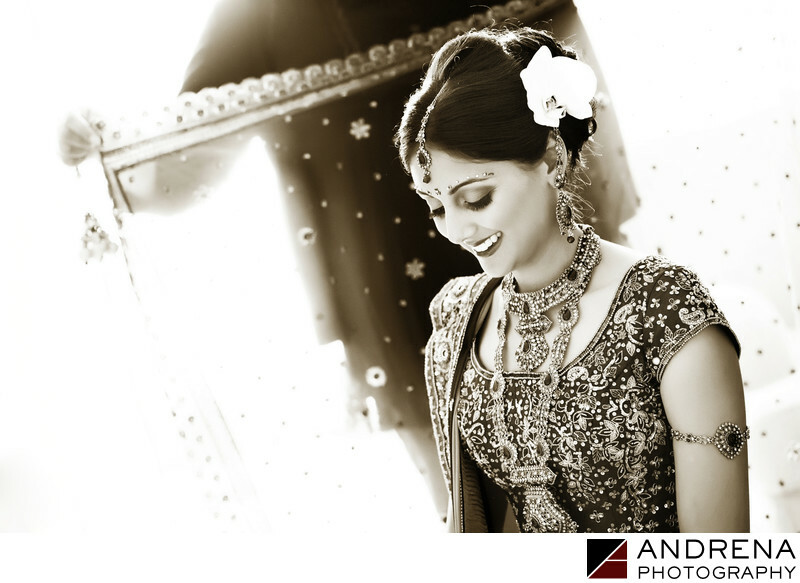 Though most of my Indian brides love color, I really adore black and white images, particularly when they highlight a lovely captured moment, as was the case with this Indian bride at the Montage Resort. I suppose my love of B&W photography comes from my earliest days pursuing this craft, when I shot Kodak Tri-X B&W film, hand-processed it in D76 developer, and made my own prints in a darkroom using Oriental #3 paper or Ilford Warm-Tone B&W paper. My first love was also photojournalism, which was traditionally shown in B&W. All the Life Magazine photography books showcased B&W photography by the true greats, thus stoking my imagination and instilling a sense that captured documentary moments were enhanced by B&W processing. I love the simple white orchid in this Indian bride's hair. Florals were provided by Bloom Box Designs, with coordination by Nikki Khan at Exquisite Events. Indian wedding photographed at the Montage Resort in Laguna Beach, California.